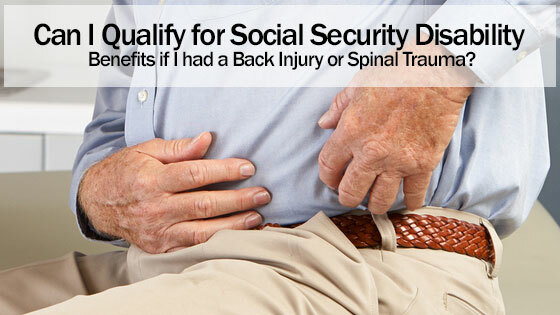 Home » Blog » Can I Qualify for Social Security Disability Benefits if I had a Back Injury or Spinal Trauma? Get Details from a Social Security Disability Lawyer. Spinal cord injuries can occur as the result of trauma to the bones, tissue and nerves around the spine. It is usually caused by something like a fall or car accident. The symptoms that a person has will depend on the type of spinal cord injury that they have experienced. The most common symptoms that people experience are numbness and pain in the body. A spinal cord injury can be classified as complete or incomplete. A complete injury causes a person to lose all of their function below the injury. An incomplete spinal cord injury causes partial loss of function below the injury. Spinal cord injuries can cause the following symptoms. How a Spinal Cord Injury is Diagnosed? MRIs and X-rays are often used to diagnose spinal cord injuries. These images can reveal the extent of the damage. Some people will be required to get surgery in order to repair the damage. Rest is an important part of recovering from a rehabilitation. However, physical therapy and occupational therapy is also important. Some people with spinal cord injuries will need to use a wheelchair for the rest of their lives. Can I get Social Security Disability if I Have A Spinal Cord Injury? In order for you to get Social Security Disability benefits, the following conditions must be met. Muscular Listing – There is a muscular listing in the Social Security Administration’s Blue Book. Osteoarthritis, spinal degenerative disc disease, vertebrae fracture and spinal stenosis are some of the conditions that are under the listing. The claimant must be able to prove that the injury resulted in muscle weakness and inability to move. Neurological Listing – If a person does not meet the muscular listing, then they may still qualify for Social Security Disability benefits if they have a neurological listing. The following conditions must be met in order to qualify. Complete Loss of Function – People who have paralysis in one or more parts of their body may qualify for Social Security Disability. Impairment of Motor Function in Two Extremities – The person must have an impairment that is so severe that they have problems maintaining balance while walking, standing up after sitting down or using their hands or arms. You will need to provide proof of disability. This includes things such as doctor statements, medical images, treatment notes, surgery records and pathology of tissue biopsy. The Social Security Administration will take several things into consideration when they are deciding whether to reward you Social Security Benefits. It is important to note a spinal cord injury diagnosis is not a guarantee that you will get Social Security Disability benefits. That is why it is important to contact a Social Security Disability lawyer. If you need a Social Security Disability lawyer, then you will need to contact us at one of the following numbers.